School is morning or afternoon only, so in theory there’s no need to serve school lunch, but there are about twenty children at school who wouldn’t get any lunch if they went home, so there are two school cooks who make lunch for them every day. 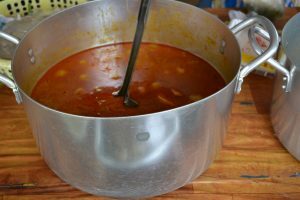 They have a sort of stew with rice, and eat in one of the classrooms as there’s no dining room. The volunteer staff walk up to the main road to eat at a little cafe. It’s the sort of place I would never have dared to go on my own, but the food is freshly cooked and very good. Lunch is eaten between 11 am and 12 noon, and at 11 o’clock all the pots of food are put on a huge table at the front of the cafe, and you choose what you want, then when it’s gone, it’s gone. 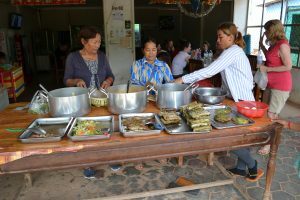 The food costs one US dollar for a main course with rice. Khmer curry, which is sweet not hot, with chicken and vegetables. 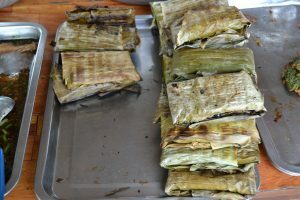 Fish amok, which is fish with coconut wrapped in leaves to form a parcel and then cooked. Both these dishes are delicious, and nothing has been as searingly hot as I had feared … yet!